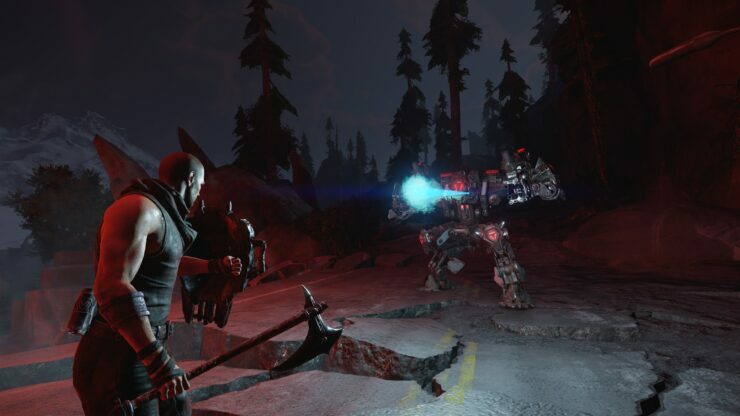 THQ Nordic and Piranha Bytes sent out a new press release on ELEX, their upcoming science fantasy roleplaying game, to showcase the Berserkers faction – one of several players will be able to join during the game. Having found a way to transmute Elex into pure Mana, the Berserkers are transforming Magalan’s shattered wastes into lush, living woodland. From their capital Goliet in Edan, they range through the world to find places to plant their “world hearts” – huge plants, able to revitalise the planet. Piranha Bytes are promising a huge, seamless open world with deep moral choices and almost complete freedom. Jorge went hands-on with the game at PAX East 2017; below you can find a couple highlights from the preview. ELEX wouldn’t be much of an action-RPG if it didn’t have a healthy amount of combat. Since the setting is a post-apocalyptic future, weapons will range from flaming broadswords and crossbows to more sci-fi armaments like plasma rifles and the devastating flamethrower. Throw in a jetpack and ELEX opens combat in a fun new way, for instance with a skill that lets you hover over a bandit and then slam down on him with the flaming sword. Of course, the jetpack also comes in handy to move around the world. Another fun tidbit about ELEX is that there are going to be Companions who will travel alongside you and comment on your actions. Players must also choose a faction that will greatly affect your notoriety in the world. ELEX seems like a massively ambitious undertaking that could easily grab 80 hours of your life in a curious violent world; let’s just hope Piranha Bytes can release it relatively bug-free unlike Gothic and Risen. ELEX will be out in Q3 2017 on PC, PlayStation 4 and Xbox One.